Evaluations and follow-up evaluations are organised alternately every five years and included in the 10-year evaluation plan. The first aim of the first evaluation is to invite the institution to conduct an in-depth self-evaluation of the evaluated programmes and, for the experts, to make useful recommendations in order to improve quality. The main aim of the follow-up evaluation is to support the institutions in their approach to continuous improvement, in the continuation of actions implemented, and in the development of guidance tools. 3)	The publication of an action plan drawn up and implemented by the institution. 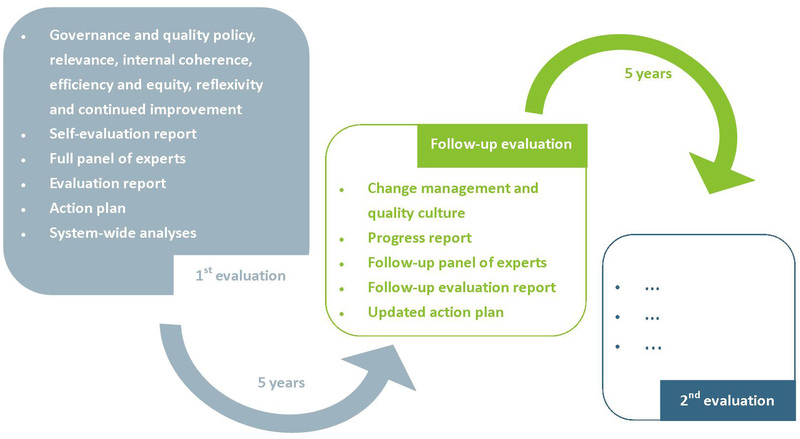 In order to avoid that the dynamics supported by the external evaluation ends with the publication of the evaluation report, in 2015 AEQES reinforced its external follow-up evaluation mechanism. Designed in the past as optional and proposed every three years, this mechanism was made mandatory as a mid-term exercise between two full evaluations. 3)	The publication and implementation of an action plan by the institution. For more detailed information, please find hereunder key documents defining the methodology of the Agency.